The President of India, Shri Pranab Mukherjee has congratulated Ms. Saina Nehwal for achieving World No.1 ranking in badminton. In his message, the President has said, “Please accept my hearty congratulations and best wishes on becoming India’s first woman to achieve World No.1 ranking in badminton. Your success is a matter of great pride for all Indians, especially women. The whole country joins your family and you in celebrating this impressive achievement. I wish you continued success in your future endeavours”. 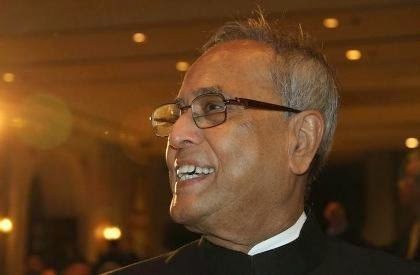 The President of India, Shri Pranab Mukherjee has congratulated the Indian Space Research Organization (ISRO) for the successful launch of PSLV-C27. In a message to Shri A.S. Kiran Kumar, Chairman of ISRO, the President has said, “My heartiest congratulations to you and your entire team at the Indian Space Research Organisation (ISRO) for the successful launch of PSLV-C27, carrying the IRNSS-1D. I am very happy to know that this is the fourth in the series of seven satellites of the Indian Regional Navigation Satellite System. I understand the IRNSS-1D will provide navigation, tracking and mapping services which will take us closer to setting up our own navigation system. Kindly convey my greetings to all members of your team of scientists, engineers and technologists involved in this great mission. I wish your future endeavours great success”. The President has directed that Dr. Aziz Qureshi shall cease to hold the office of the Governor of Mizoram and has appointed Shri Keshari Nath Tripathi, Governor of West Bengal, to discharge the functions of the Governor of Mizoram, in addition to his own duties, until regular arrangements for the office of the Governor of Mizoram are made. The President of India, Shri Pranab Mukherjee has condoled the passing away of Shri P. R. Kyndiah. In his condolence message to his son, Shri Waibha Kyndiah, the President has said, “I am deeply saddened to learn about the passing away of Shri P. R. Kyndiah, a friend and colleague of long years. A distinguished Parliamentarian and veteran Congress leader, Shri Kyndiah served the nation in various capacities during his long public life. As Union Minister in-charge of Tribal Affairs and Development of North Eastern Region (DONER), he initiated a number of measures for the progress and development of the people of the North East. He also made immense contribution as Member of Legislative Assembly of Meghalaya, Minister and acting Chief Minister of Meghalaya and Governor of Mizoram. In his death, the nation has lost an eminent personality. Please accept my heartfelt condolences and convey the same to the rest of your family members. I pray to the Almighty to give you and other members of the family the strength to bear this irreparable loss”. The President of India, Shri Pranab Mukherjee has condoled the passing away of Brig. T. Sailo, former Chief Minister of Mizoram. In his condolence message to his wife, Smt. Thansiami Sailo, the President has said, “I am sad to learn about the passing away of your husband Brig. T. Sailo, former Chief Minister of Mizoram. Brig. Sailo was a visionary leader who made immense contribution to the welfare of the people of the State of Mizoram. As Chief Minister of the State, he initiated a number of developmental projects including for generating hydel project, rail communication and programmes for increased food production. For his exemplary services, he was awarded with the Padma Shri by the Government of India. Please accept my heartfelt condolences and convey the same to the rest of your family members. I pray to the Almighty to give you and other members of your family the strength to bear this irreparable loss”. A group of young participants attending 7th Tribal Youth Exchange Programme (TYEP) organized by Nehru Yuva Kendra Sangathan called on the President of India, Shri Pranab Mukherjee at Rashtrapati Bhavan today (March 28, 2015). Speaking on the occasion, the President welcomed the participants of 7th Tribal Youth Exchange Programme to Rashtrapati Bhavan. He stated that there is a lot to learn from the tribal societies. The gender behaviour and relations in tribal communities and the respect and honour accorded to tribal women in their societies holds significant lessons for us. We must also learn from the manner in which the tribal societies have retained, nurtured and developed their contact with nature. The President said that the notion of tribal welfare is not just about development of tribal communities through economic progress but a larger concept of lifestyle that fosters holistic living. The philosophy for tribal welfare enunciated by Pandit Jawaharlal Nehru was human development with conservation of their rich and diverse cultural heritage. The challenge in preparing any policy for tribal upliftment exists even now as the policymakers have to strike the right balance between preservation of tribal identity with their distinct culture and values, while ensuring their access to mainstream education, healthcare and income generating opportunities. The President said that the seventy third amendment to the Constitution bestowed special powers to the Gram Sabha in tribal villages and hamlets in decision-making and self-governance. This has provided an impetus for protection of rights and enhancement of welfare of the tribals. At this point of time, when the country is marching forward in unity, it is absolutely essential that we ensure all segments of society to participate in and benefit from inclusive and equitable growth. The Government has taken several measures for the development of the tribal population. It has emphasized on rapid educational development to bring tribals into the mainstream of the population. It has allocated considerable resources to provide infrastructure and other incentives such as scholarships, free boarding and lodging, free distribution of clothes, books and stationery for better educational attainment by the tribals. The President said that education and capacity building can open a window of opportunity for the tribal youth. The educated youth from tribal societies, can usher in progress and bridge the development gap. He called upon them to be the torchbearers of a young and resurgent India. He stated that they must join hands with the youth from the rest of the country to build the India of our dreams. They must engage with the affairs of the nation whole-heartedly. They represent a potent force in the fight against criminality, poverty, deprivation, backwardness, domestic violence, caste discrimination, gender discrimination and exploitation. They also must give voice to the voiceless and become the strength of the weak. He called upon them to make the struggle of the needy and deprived their own. The Prime Minister, Shri Narendra Modi, today congratulated India`s scientists on the launch of IRNSS-1D satellite. Launch of satellite IRNSS-1D is yet another manifestation of the exemplary efforts and utmost brilliance of our scientists. Congrats to them," the Prime Minister said. Sri Mata Amritanandamayi Devi today called on the Prime Minister Shri Narendra Modi at his residence and blessed him. Sri Mata Amritanandamayi showed keen interest in Namami Gange. The Prime Minister expressed his gratitude to her for her great contribution to the Swachha Bharat Abhiyan and requested her to initiate a toilet construction project in the villages of five states of Ganga river basin, to which she agreed. All party delegation of Members of Parliament from Tamil Nadu under the leadership of Dr. M. Thambi Durai, Deputy Speaker, Lok Sabha met the Prime Minister, Shri Narendra Modi, today on the issue of Cauvery water dispute. The delegation members handed over a memorandum on the issue to the Prime Minister and requested for immediate and amicable solution of Cauvery water dispute. The Prime Minister, Shri Narendra Modi, has tweeted about his upcoming three-nation tour to Germany, France and Canada. "My France, Germany and Canada visit is centred around supporting India`s economic agenda and creating jobs for our youth. Will discuss strengthening India-France economic co-operation and visit some high-tech industrial units outside Paris. In Germany, Chancellor Merkel and I will jointly inaugurate Hannover Messe where India is a partner country. Looking forward to enhancing ties with Canada and interacting with leaders, captains of industry and diaspora in Canada," the Prime Minister tweeted. ISRO`s Polar Satellite Launch Vehicle, PSLV-C27, successfully launched the 1425 kg IRNSS-1D, the fourth satellite in the Indian Regional Navigation Satellite System (IRNSS) today evening (March 28, 2015) from Satish Dhawan Space Centre SHAR, Sriharikota. This is the twenty eighth consecutively successful mission of the PSLV. The `XL` configuration of PSLV was used for this mission. Previously, the same configuration of the vehicle was successfully used seven times. After the PSLV-C27 lift-off at 1719 hrs IST from the Second Launch Pad with the ignition of the first stage, the subsequent important flight events, namely, strap-on ignitions and separations, first stage separation, second stage ignition, heat-shield separation, second stage separation, third stage ignition and separation, fourth stage ignition and satellite injection, took place as planned. After a flight of about 19 minutes 25 seconds, IRNSS-1D Satellite was injected to an elliptical orbit of 282.52 km X 20,644 km (very close to the intended orbit) and successfully separated from the PSLV fourth stage. After injection, the solar panels of IRNSS-1D were deployed automatically. ISRO`s Master Control Facility (at Hassan, Karnataka) took over the control of the satellite. In the coming days, four orbit manoeuvres will be conducted from Master Control Facility to position the satellite in the Geosynchronous Orbit at 111.75 deg East longitude with 30.5 deg inclination. IRNSS-1D is the fourth of the seven satellites constituting the space segment of the Indian Regional Navigation Satellite System. IRNSS-1A, 1B and 1C, the first three satellites of the constellation, were successfully launched by PSLV on July 02, 2013, April 04, 2014 and October 16, 2014 respectively. All the three satellites are functioning satisfactorily from their designated orbital positions. IRNSS is an independent regional navigation satellite system designed to provide position information in the Indian region and 1500 km around the Indian mainland. IRNSS would provide two types of services, namely, Standard Positioning Services (SPS) - provided to all users - and Restricted Services (RS), provided to authorised users. A number of ground stations responsible for the generation and transmission of navigation parameters, satellite control, satellite ranging and monitoring, etc., have been established in many locations across the country. In the coming months, the next satellite of this constellation, namely, IRNSS-1E, is scheduled to be launched by PSLV. The entire IRNSS constellation of seven satellites is planned to be completed by 2016. The Union Minister of State (Independent Charge) of the Ministry of Development of Northeastern Region (DoNER), MoS PMO, Personnel, Public Grievances, Pensions, Atomic Energy and Space, Dr. Jitendra Singh has said that as a matter of principle and as an essential dictum, it is mandatory for every pregnant woman to undergo a Blood Sugar test as soon as she comes to know of her pregnancy and ideally, even before pregnancy when she is planning a baby. He was addressing the inaugural session of the Annual Conference of Diabetes in Pregnancy (DIPSI 2015) in Ooty, Tamilnadu today. Dr Jitendra Singh said, if India is to get rid of the dubious distinction of a country with an epidemic of diabetes, it is imperative to prevent the occurrence of diabetes in pregnancy, particularly Gestational Diabetes Mellitus. This will not only result in better outcomes for both mother as well as her baby, but will also help in preventing the cycle of generation to generation transmission of diabetes through family preponderance, he observed. This is particularly evident in the light of the fact that children born to diabetic mother are not only prone to develop diabetes, but are also at the risk of diabetes at a much earlier age, he added. In a country like India, Dr Jitendra Singh said, where there is already a higher phenotype preponderance for diabetes and carrying out a mass blood sugar test is fraught with several hassles, the need of the hour is to indigenously devise easier methods for screening of diabetes in pregnancy. For this purpose, he advocated that any pregnant woman visiting any hospital or clinic at any period of her pregnancy, early or late, should be immediately subjected to a blood sugar test, irrespective of whether she is fasting or non-fasting. There is enough data to show that by doing so, it is possible to pick up undetected Diabetes during pregnancy or even to detect tendency to develop Diabetes, he added. For further simplification of this process, Dr Jitendra Singh advocated that instead of going in for conventional Oral Glucose Tolerance Test, it is advisable to go for a single Glucose Challenge Test (GCT). He said, in India after Dr. V. Seshiah, he was among the first to have carried out and compared conventional oral glucose test with single glucose test and the conclusion was that even with single GCT, the sensitivity and specificity of screening was100% accurate. This procedure, he said, has reduced the cost of test which is an important consideration in a developing country like India and at the same time, it eliminates the requirement of calling pregnant woman next day on an empty stomach which very often she may be unable to come back on account of several domestic or family reasons. Dr Jitendra Singh complimented Dr. V. Seshiah whose concept of single glucose challenge test has been acknowledged across the world and also by the World Health Organization. Dr Seshiah is truly the father of ‘diabetes in pregnancy research’ in the world, he said. The 29th Edition of India Carpet Expo has attained a new milestone in terms of number of overseas buyers and response from carpet importing countries. As of this writing, 300 buyers have transacted business with participating exporters/exhibitors. Briefing the media, Shri Kuldeep R. Wattal, Chairman, Carpet Export Promotion Council (CEPC) said that the trend looks very good for the remaining two days as well. He said that while India Carpet Expo has attained the status of the largest carpet fair in Asia, it has also received great appreciation from visiting overseas buyers. The latest designs and colours employed, based on the feedback received from importing countries, have contributed to the increased number of orders. Shri Wattal added that the higher volume of business indicates also that the Indian carpet industry is set to retain its status as the number one carpet exporter, in terms of value as well as volume; this, he said, is despite setbacks such as hike in import duty on hand-knotted carpets by the Turkish Government, devaluation of euro and other recessionary trends in Europe. The Expo, which is into its second day, was inaugurated yesterday by the Minister of State for Textiles (I/C), Shri Santosh Kumar Gangwar. It will conclude on 30th March 2015, and is being held at Pragati Maidan, New Delhi.